Colorful Creativity And Heart Pumping Exercise Combined. Stuff Points: Earn 20 points when you buy this stuff. 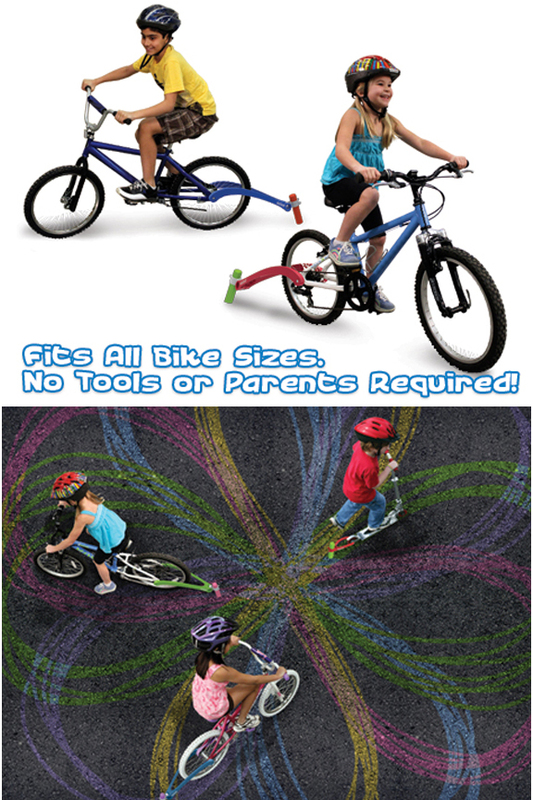 Attach to any bicycle to create colorful drawings while rolling down the street, cruising in the driveway, or meandering along a sidewalk. This fun looking chalk holder connects without the use of tools, and features a clever design that applies the perfect amount of pressure to keep chalk on the road. As long as the pedals are pumping, colors will be flowing, and children will enjoy discovering all of the shapes and designs that can be created. It's incredibly fun to use when riding solo, but when kids team up, the possibilities increase exponentially, and each rider learns to work with others in order to draw something amazing. Get their creative juices flowing in a matter of seconds because it clamps on quickly, and chalk is loaded in a flash. You can use it with any wheel size, and it even works with training wheels. Each piece of chalk will last for up to 1.5 miles of riding, and this set comes complete with one piece to get you started. Order extra pieces separately to extend enjoyment, and keep your kids outside, breathing fresh air, all summer long. Universally Compatible. IT doesn't matter what brand or size your kids have, and it can even attach to mom and dad's bike as well. The one size-fits-all sizing removes all guess work, and guarantees it will work on any bike you try it on. No Tools Required. Tension keeps it in place as it holds strong to the nut and bolt that connect the rear wheel to the frame. Simply pop it on to complete the install process. Totally Reusable. One piece of chalk will last a while, but you will naturally want to reload it. Use it over an over again on the same bicycle, or easily move to another one. Quick Loading. 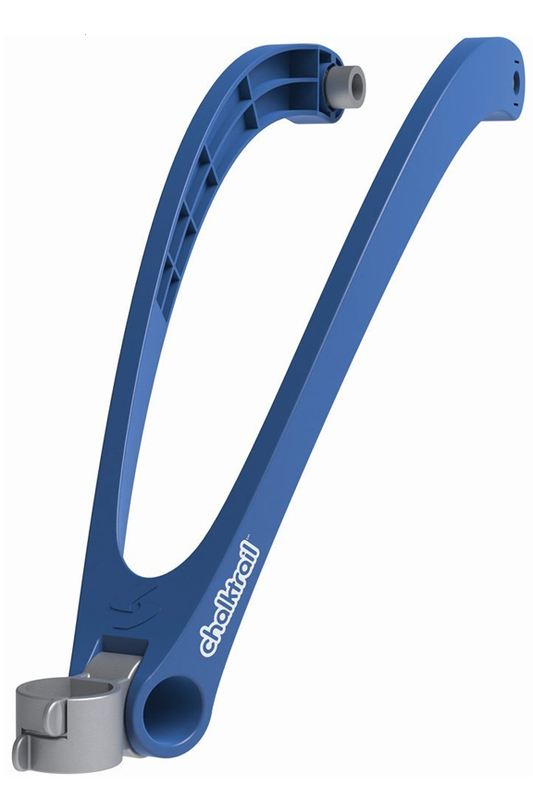 An easy to use system keeps a single piece of chalk in place at the end of the curved holder. Anyone can quickly unload it, or reload it because it requires little strength or effort, and it can be done in a just a few seconds. Chalk Included. You will get a single piece packaged with this holder, so it will be ready to use, right out of the package. More can be ordered separately. Healthy And Creative. Give kids another reason to put the video games down, and turn off the TV. You will be amazed at what they make, and how they interact with each other. Get their hearts pumping, and let the oxygen flow. Parental guidance and assistance is not required, and there is no hardware necessary, or tools required. A simple wishbone-style clamp will connect to the center hub on the back wheel of the bike you install it on. At the end, and towards the bottom, another clamping system will hold the chalk in place. 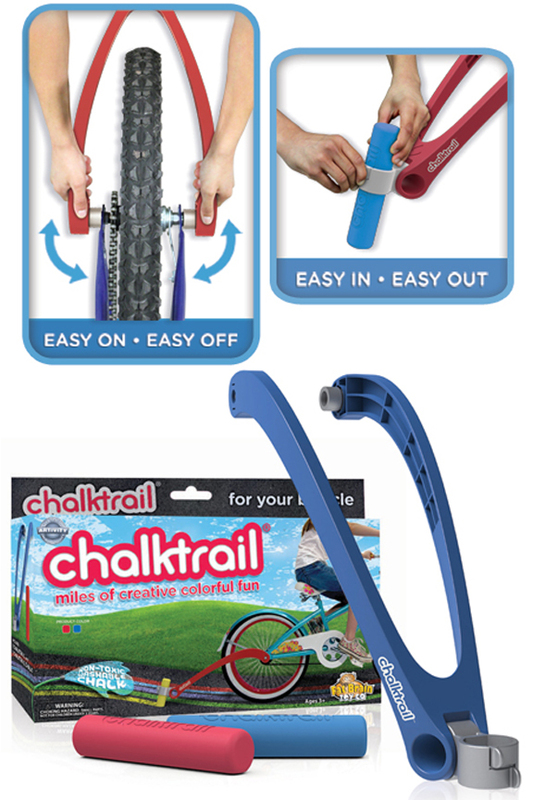 Depending upon wheel size, a quick adjustment at the end will ensure that chalk is held at the perfect angle. It's safe and easy, so any kid can do it themselves, and any child will be able to put it on, or take it off as often as they want. Slow or fast, straight or squiggly, it doesn't matter how your child rides. They can set out to create a specific design, or ride along as usual, only to discover a vibrant trail of color forming behind them. Once they turn around to retrace their original path, more intricate drawings and shapes will begin to emerge. A single rider can can draw smiley faces, flowers, and racing paths, but when multiple riders collaborate, the designs they create, and the games of chase they play will delight those involved, and amaze parents observing. Because each large piece of chalk lasts for up to 1.5 miles or drawing, your kids may wear out before it does. The simple design offers obvious functionality, and allows any bike rider to turn roads and other flat surfaces into a gigantic canvas to express their creativity. With no complicated parts to assemble, or hardware to lose, putting this device on any bicycle could not be easier. Just pull the the arms apart, align with the center of your rear hub, and then allow the arms to clamp into place. Once on the bike, install a piece of chalk and set it to the right angle to complete the set up process. Stop boring your kids by making them ride regular bikes, and get them excited to go outside. Kids will spend more time getting physical, and less time sitting inside, and that will help to promote a healthy lifestyle and proper brain function. Make you child the envy of all other kids in the neighborhood, or team up with other families to set loose a graffiti squad to blanket the streets with youthful enjoyment. This set comes complete with the holder and one piece of chalk as the standard package. You can order more pieces separately, or you can bundle extra pieces with your set to save money and be prepared for miles and miles of fun. Uses Attach to any bike to let kids draw as the ride. Awards Product of the Year 2013, Family Review Center! Creativity and exercise combined. Let kids draw colorful pictures as they ride their bikes. Colorful lines will follow them everywhere they go. Order Yours Today! Will this work on a power Wheel chair? As long as there is a similar location to apply the tension mount, yes, it should work fine. Solve The Puzzle To Stop The Stampede!